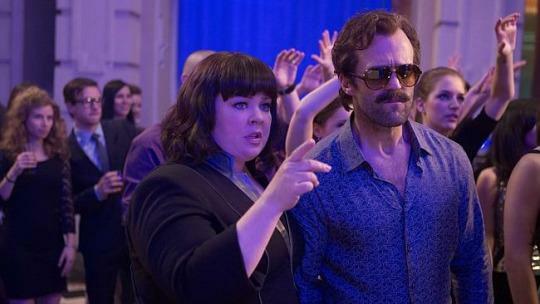 The film follows Susan Cooper (Melissa McCarthy) who trained as a fully operative CIA agent but now finds herself desk bound and an aid to her partner Bradley Fine (Jude Law), she works as his eyes and ears behind the scenes. When Fine and his rival in the field Rick Ford (Jason Statham) are compromised Susan offers to go undercover to prevent a nuclear missile falling into the wrong hands. Cue a whole heap of double agents and high speed car chases as you would expect. One of the highlights of this film for me was, to my surprise Jason Statham aka Rick Ford he plays the tough (but rather incompetent) CIA agent with brilliant deadpan aplomb. The one liners delivered with regard to how tough he is are just brilliantly ‘OTT’ ‘I once had my arm ripped off and then had to sew it back on with my other arm’. Statham is perfectly cast in this role and obviously is not afraid to poke fun at his own previous roles. The chemistry between himself and McCarthy is perfect and the scenes when they are together are some of the best in the film. I have read a lot of reviews about this film complaining about ‘cheesy acting’ and ‘predictable plotlines’ but I dont think this film was ever out to win oscars for its incredible storyline or unbelievable portrayals. This film is what it is, it’s a light hearted comedy that makes you laugh for a few hours and then you forget it. It actually made me laugh a lot more than I thought it would and for once not all the laughs are in the trailer.